Lovely decking by a lovely man! We only wanted a small area decking but Howard was very happy to oblige….very thorough job…tidy and extremely considerate…left absolutely no mess ….would HIGHLY recommend him to anyone wanting decking done. Really pleased with our new area….thankyou very much. Howard has just finished the decking / borders as per the garden design he drew up. Not only is his finish impeccable, but he is such a nice person helping out right from design to after-care. 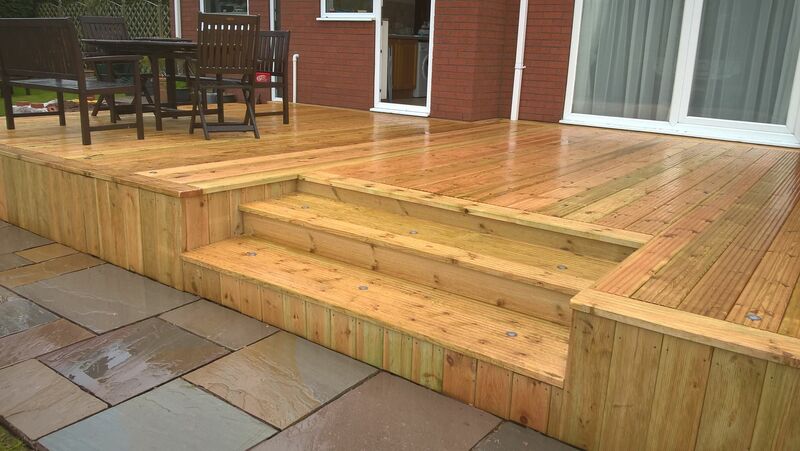 I cant recommend just decking (Howard) enough if youre in the Stoke on Trent area. Howard was great, our garden was just mud and now looks beautiful. We are over the moon with the decking and our lovely house that Howard & Steve built for our hot tub. Excellent attention to detail, exceptional workmanship and very reasonable prices. They were a pleasure to have in your home. I have already recommended them to friends and family and we are already planning on having them back for the next project in our garden.